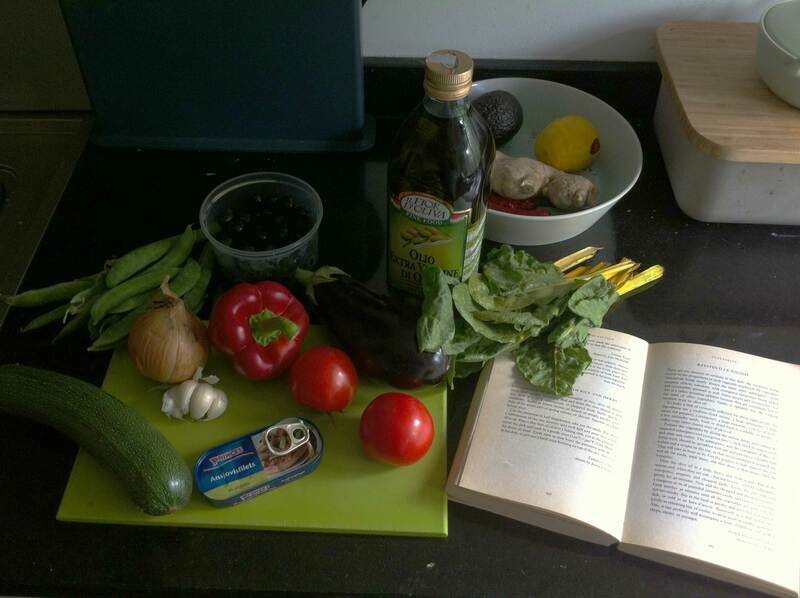 Today i’m gonna eat ratatouille. I have made this so many times before. I do usually eat this with some pasta, as a sauce. It’s also good with different cuts of meat, omelettes or baked potatoes. Or simply on its own. Some vegetables are required, i do add others if i have any. I start with slicing the onions and frying them for a couple of minutes. 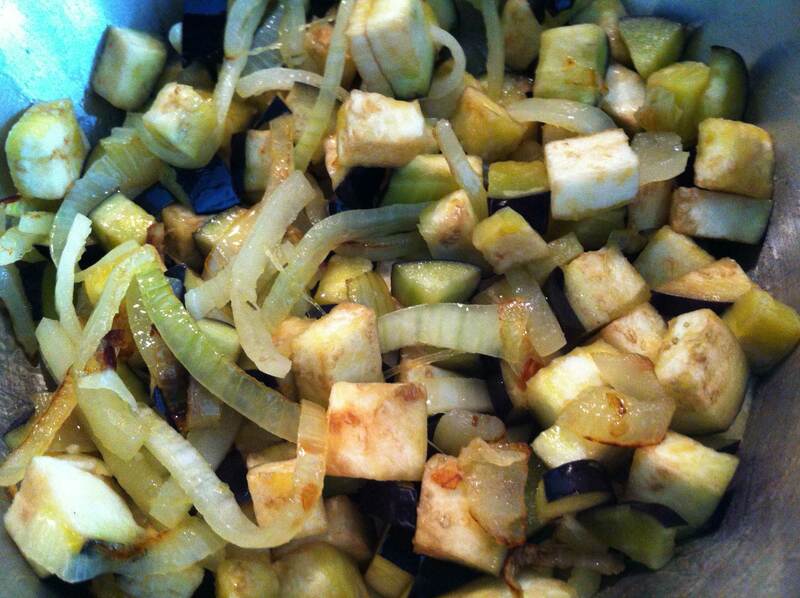 While they fry, i cut the eggplant and add the pieces. The courgette i first quarter and remove the seeds. Then i cut each piece in two and slice each part in around 1 inch cubes. These are added to the onions and eggplant. 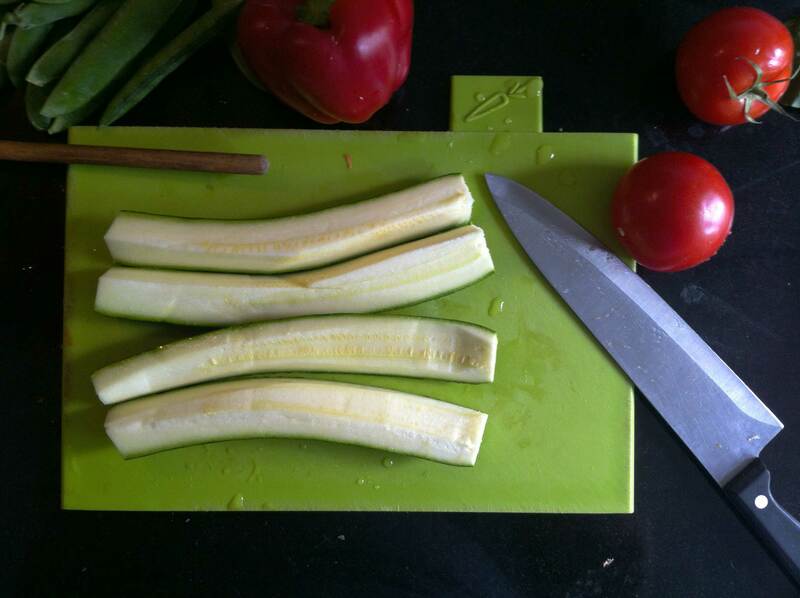 The bell pepper is halved, the seeds removed and cut into 1 inch pieces. These are added to the other vegetables. The garlic is sliced up and added too. The anchovies and the oil they are kept in are added too. These vegetables are simmered for around half an hour. In that time, cut up the tomatoes, get the peas from their shells, slice the chard. 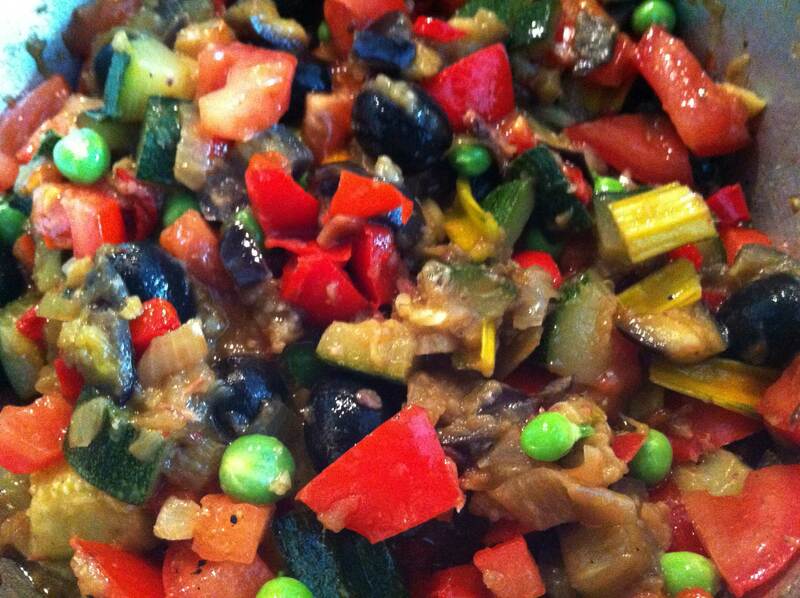 After the half hour, add all these vegetables and the olives, around a handful. Let this simmer for another 10 minutes or so. 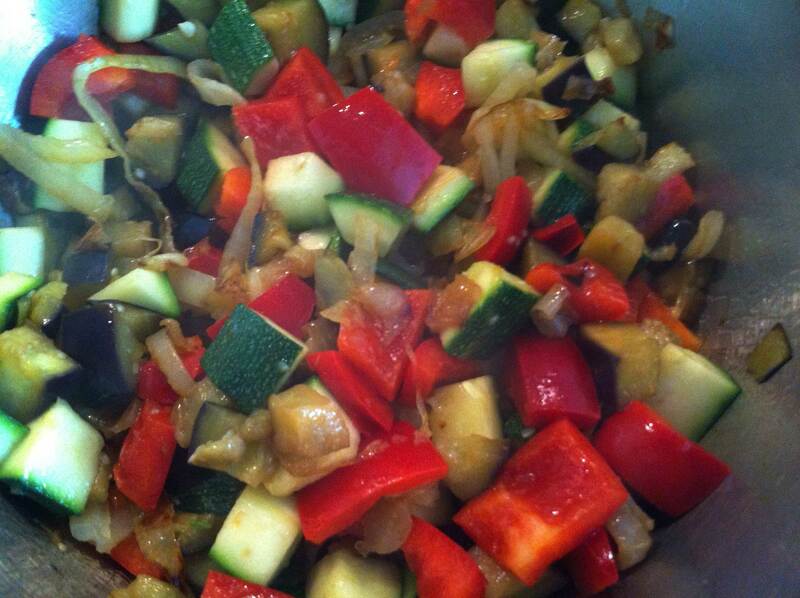 This is the way i make ratatouille. 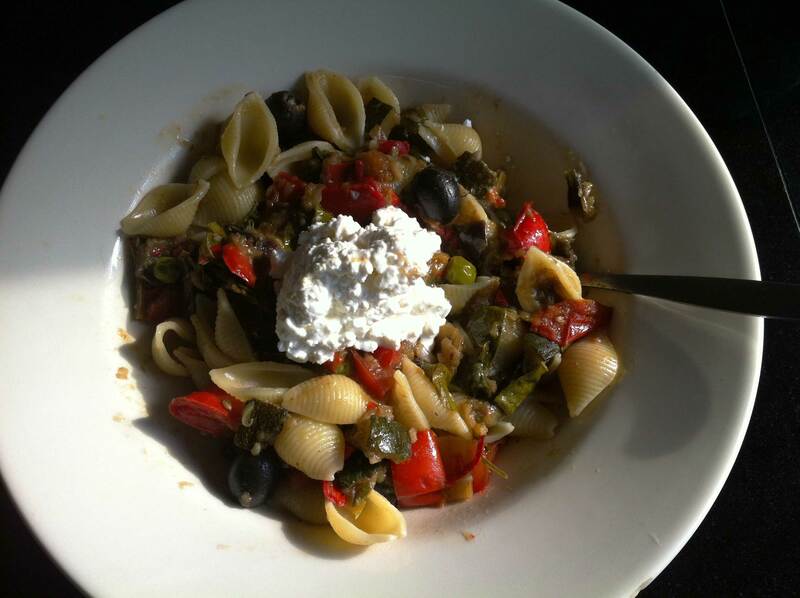 I cooked some pasta at the end, added the ratatouille and put some cottage cheese on top of it all. I also added a bit of olive oil on top of it all. I did read Elizabeth David‘s recipe beforehand and followed it broadly. The peas, chard, anchovies and black olives i added myself. I love this dish. In all its forms and shapes!